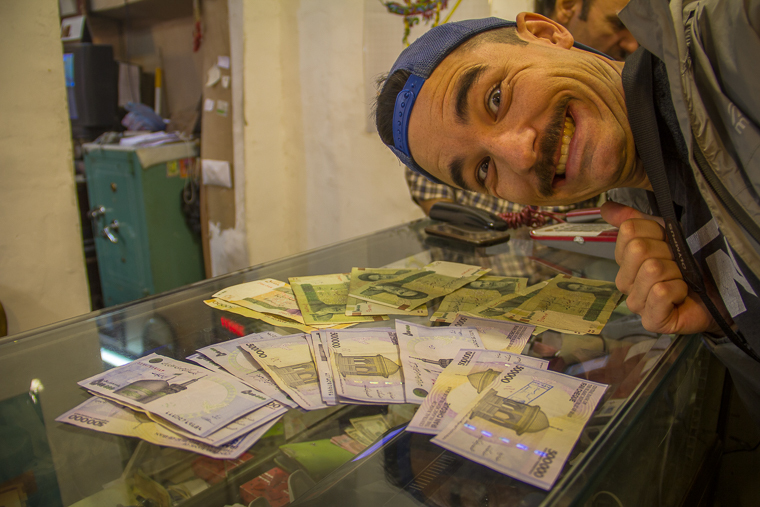 This post is a rundown of how much backpackers should budget when they travel to Iran. It contains average prices for food, transport, “fun stuff”, accommodation and our total expenditures on each of those categories. This is based on a detailed record we kept (click to access the budget spreadsheet we used) of our 2-week trip in November 2016. Since spending 2 months travelling around Morocco, we haven’t been to a country as cheap as Iran. The cost of food, transport, and accommodation is easy on the wallet. The only thing that’s relatively expensive is the entrance fees to mosques, palaces, and gardens. 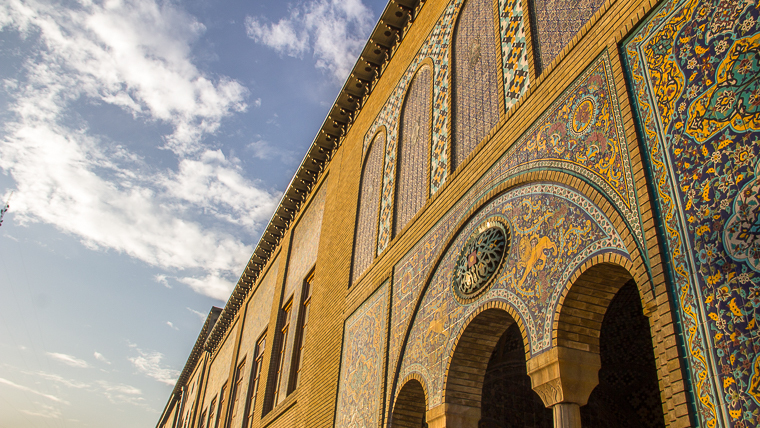 However, as long as you pick and choose the places you want to visit, Iran is a great country to backpack in. This is the only downside to what is a shockingly underrated country. Over 13 days we spent a total of €339 per person. This means that our total daily average was €26 each. This total includes accommodation, food, transport, fun, visas and travel insurance, airport transfers and a SIM card. It doesn’t include the cost of our flights to Iran. If you exclude the costs that aren’t related to living (visa on arrival, insurance, airport transfers and SIM card), our cost of backpacking in Iran for 2 weeks was €237 per person. This calculates to a daily average spend of €18 per day for accommodation, food, transport and fun. One of the main planning tasks before a backpacking trip is to make a budget. When you travel to Iran, this is taken to the next level since Iranian ATMs don’t take foreign credit cards. This means you’ll have to bring the amount of money you’ll need in cash, which then means you must have a pretty good idea of how much you’re going to spend. Another annoying part of the Iranian financial world is the official currency in Iran is rial, but in daily life, prices are quoted in toman. Confused? 1 toman = 10 rials, meaning that you should just add one zero to the price to convert it to rials. This is meant to make things simpler, but for tourists, it’s generally just confusing. Some places restaurants and attractions are in rial and then some are in Toman. After a few days you’ll get the hang of it, but don’t worry everything here is quoted in rial. O and when you thought it couldn’t get anymore confusing there’s one last hurdle when you get money exchanged it’s based on the black-market exchange rate and not the official exchange rate. Everyone (hostels, tours, shops, etc.) uses the black market rate and no one uses the “real” rate. This means XE.com is useless and you’ll have to manually work out your exchange rate is. At the time of writing, the black market exchange rate was IRR 39,231 to €1 and the official exchange rate was IRR 34,266. We used the black market rate in this post. Now you’re all up to speed on the financial situation in Iran here is a break down of our numbers. We’ll be going through the average cost of food, transport, accommodation and “fun stuff”. This also includes not only an average of what we spent overall on each category but an average cost for items everyday backpackers will buy while in Iran. This way you’ll be able to make your own estimate on average spend per day if you travel a little different to us. To keep our costs down, we normally ate 2 cheap meals and 1 restaurant meal a day. Near the end of our trip, we started getting sick of falafel and chose to go for restaurant meals more often, bringing our average expenditure up. We didn’t use much inner-city transport in Iran as most tourist areas are easily walkable (we did a solid 15 km a day!). Between cities, we would choose the normal buses and always haggled over the price, lowering it by up to 25%. The VIP buses aren’t worth it unless you’re doing an overnight trip. 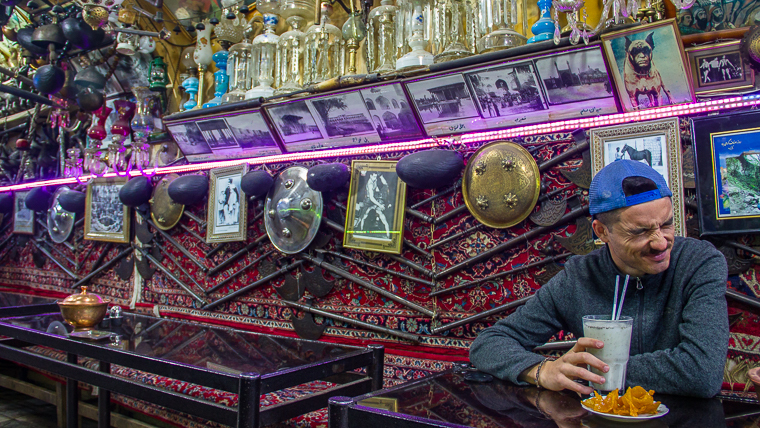 If you don’t want to break your bank on entry fees in Iran, you have to be selective with the amount of tourist attractions you visit. We regularly haggled our way down to 2-for-1 tickets or even paying the Iranian ticket price, which is 8-15 times less than the tourist price. Mosque entry prices. Left: 150,000 rial for tourists. 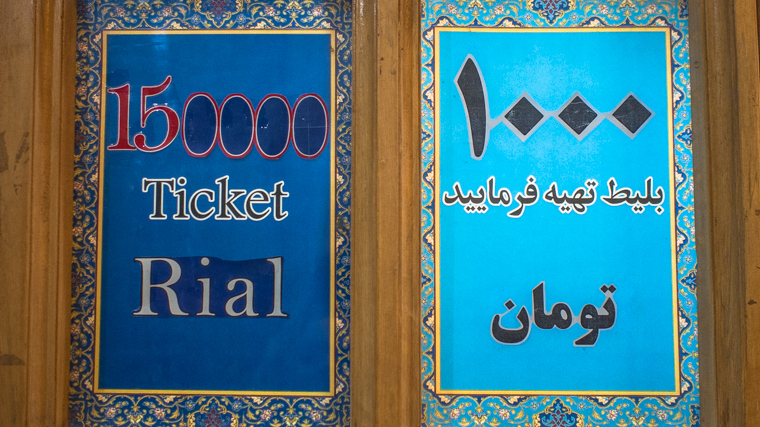 Right: 10,000 rial for Iranians. Our accommodation cost is quite low because we couchsurfed for 5 nights. You can find hostels in every major city in Iran and dorm beds average €8-13, with cheaper guest houses located outside of the tourist areas. Hi. Am I able to mail/ship any goods out of Iran to the U.S.? Like maybe, a bag of Iranian chips with cool Iranian packaging? Sorry mate we didn’t try and mail anything out of the country, so noT sure on that one. Have a great trip though! Loving your blog! I’m dying to go to Iran (unfortunately I’m American and Israeli so can’t get there at the moment…) but definitely going to come back to your posts the minute I can go! It looks amazing.